Is Digital Foil Printing the Best Choice for Brochures? Digital foil printing is actually very different from the traditional block foil printing method. Although we’re focusing on digital foil printing, both methods will leave your printed products with shiny, metallic accents so there’s no wrong answer on which method to pick - but traditional block foiling is a more popular option. What’s different, however, is the way that they’re both printed and the finished effect you get from both. With brochures being arguably the most effective printed marketing material out there, is digital foil printing the best choice for it? Traditional foil printing involves applying metallic foil to paper or cards using heated plates. This leaves the foiled elements textured and debossed as the foil is hot pressed on to the card or paper stock. Digital foil printing, on the other hand, doesn’t need the use of plates. Instead, it’s printed directly from a file on a computer which means there are no set-up costs - and has many other benefits as well as certain downfalls. It’s essentially the process of adding foil on to a printed design by using a die. This foil is permanently stuck to the design to create a shiny metallic effect. When used in moderation, digital foil printing can be perfect for your brochures if you’re trying to come across as a premium brand, but it can have some limitations. With digital foil printing, production times are greatly reduced compared to the traditional foiling method. This is because no plates or ink need to be used and if you’re working towards a tight deadline, it’s a less risky option as well. Let’s face it, the software and technology available on computers now mean that you’re able to have fewer limitations. With digital foil printing, you can be more intricate with your designs while still using advanced printing techniques like LED UV. When you’re planning on creating brochures, there’s a lot of focus that goes into standing out from the hundreds of other brochures that companies are producing. With digital foil printing, you don’t have to settle for one set design for every single brochure. Even once the foil has been digitally applied, you can still go one step further and add additional printing finishes. This includes varnish, for example, which can be applied to create a different effect to the finish and makes a more level surface that leaves a lasting impression. Although, the same can be said for traditional block foil printing. Digital foil printing results in a top quality, high visibility label. Consumer psychology has shown that the more appealing a product’s packaging is, the more likely they are to pay attention. Brochures boast a lot more space than smaller marketing materials, so they’re a popular option for describing a business or product. However, don’t make the mistake of deciding to foil print every aspect of your brochure. Instead, focus on the benefit to the customers and either highlight the important information or use foil printing to make a design really pop out. It should be used as an embellishment to draw attention to a certain aspect of print as it creates a beautiful shimmering effect that captures attention while conveying luxury and quality. Put your phone number, email address and website in foil. Include a foil map which shows your location. As premium as digital foil can look on a finished product, it might not always be the case. However, that’s not down to the actual technique, it depends on the type of stock you use. If your brochures are made from cheaper materials that don’t look good, then foil printing won’t do much to enhance a poor product. As traditional block foiling uses printing plates, it trumps digital foil printing in regards its versatility on being used on pretty much any stock. As digital foil printing allows you to create different variations of brochures because it’s all done digitally, it makes it much easier to go off-brand by the colours you use. The biggest companies in the world stick to colours that are associated with their brand, so the same should apply to yours. While it can be tempting to use gold, red, silver or pretty much any other coloured foil on your brochure, it can take away something vital from your brand as it can become less recognisable. So, stick to foil colours most relevant to your brand and in places that will capture attention while looking premium. Although digital foil printing is the more cost-effective option, that’s not guaranteed to be the case if you need higher quantities of your brochures which all feature digital foil printing. If you’re producing a commercial volume of brochures for different reasons, then digital foil printing wouldn’t be the cheapest option. In short, it can be. However,it’s not your only option and depending on your project, traditional block foiling can be the way to go instead as it shines where digital foil printing can’t excel as much. Traditional block foiling has pretty much all of the same advantages of digital foil printing - and more. Here are more reasons as to why traditional block foiling is the best method to use for brochures. There are famous companies out there that already use traditional block foiling. This is why the technique has become associated with higher quality and as perception is essential to action, this is a huge advantage if you implement this technique into your brochures. By using traditional block foiling in your brochures, you can make them associate with higher quality brochures as opposed to other similar brochures. It can help to raise brand awareness, increase sales in your field and even stand out to students if you’re using the method in prospectuses. With traditional block foiling, you get a bright, metallic and reflective finishing which brings your end product to life. The colours don’t look flat and people holding those brochures will be intrigued by the way lights can alter the way the foil shines. By using traditional block foiling, the method enhances your printed product by lifting the appearance to a new level that can’t really be achieved with digital methods. In the end, it makes the key areas of your brochure stand out a lot more than traditional methods. In crowded marketplaces today, it’s more important than ever to creating a memorable product so that you can separate yourself from the ordinary crowd that are all using the same techniques. While digital can be seen as more common, traditional block foiling can achieve the vibrant colours that demands customers’ attention and leaves that extremely important first impression. 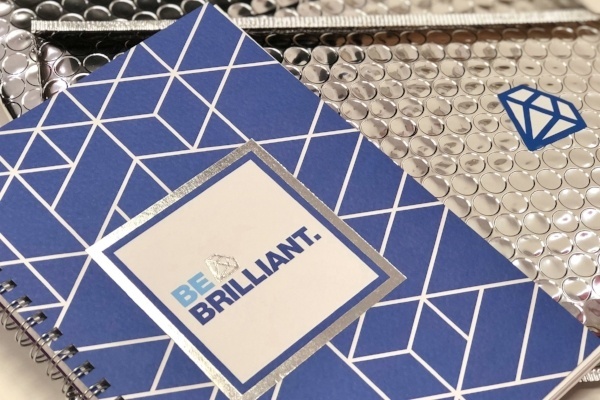 The unique finish that your brochure will get from the traditional block foiling method establishes premium brand positioning - which enables premium pricing at the same time. The rich, metallic finish you get is more likely to get noticed by potential customers than finishes they’re used to seeing daily which don’t stand out as much. As traditional block foiling is more reliable and eye-catching, people will be more confident if they’re buying from you based on the quality and finish of your brochure. The finish you get from traditional block foiling assures customers of the authenticity and quality of your products. Plus, the finish leaps out a lot more from a visual perspective as is stimulates the urge to ‘touch and feel’ the brochure. By encouraging readers to engage with your product, it’s more likely to end with them engaging with your brand as well. 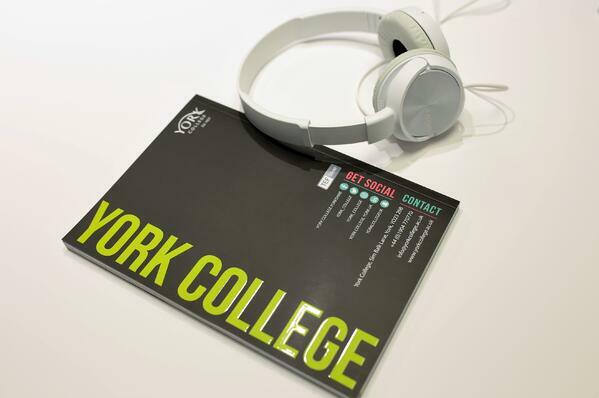 Take a look at this brochure/prospectus that we produced for York College where the use of scodix sense has helped differentiate it from their competition. The high shine gloss finish over the images helped bring them to life and created a captivating contrast against the matte laminate finish on the rest of the cover - while the silver foil helped to give it that first-class feel. 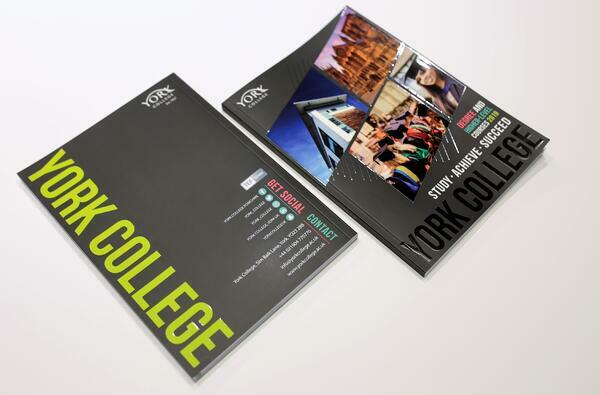 By utilising Hi Build Sense varnish on the cover, alongside a unique design, York College managed to get an ultra HD looking prospectus that you don’t see every day. Plus, it used LED UV to give a more vibrant look and something that is difficult to put down.